Hello, dear friends! 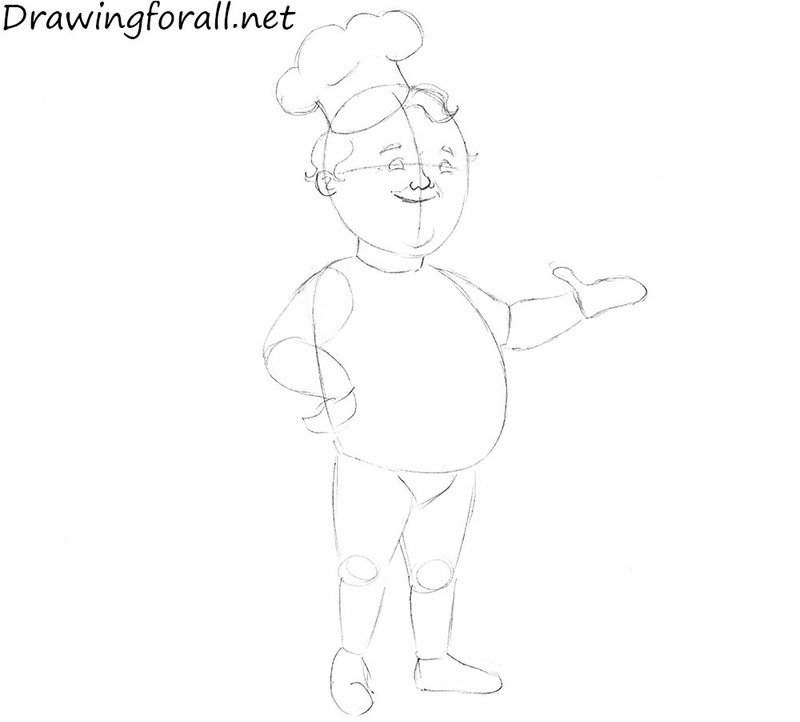 In today’s drawing lesson, we will show you how to draw a cook for kids. It will be a very simple tutorial, which we have divided into a several simple steps. So, let’s start this tutorial! 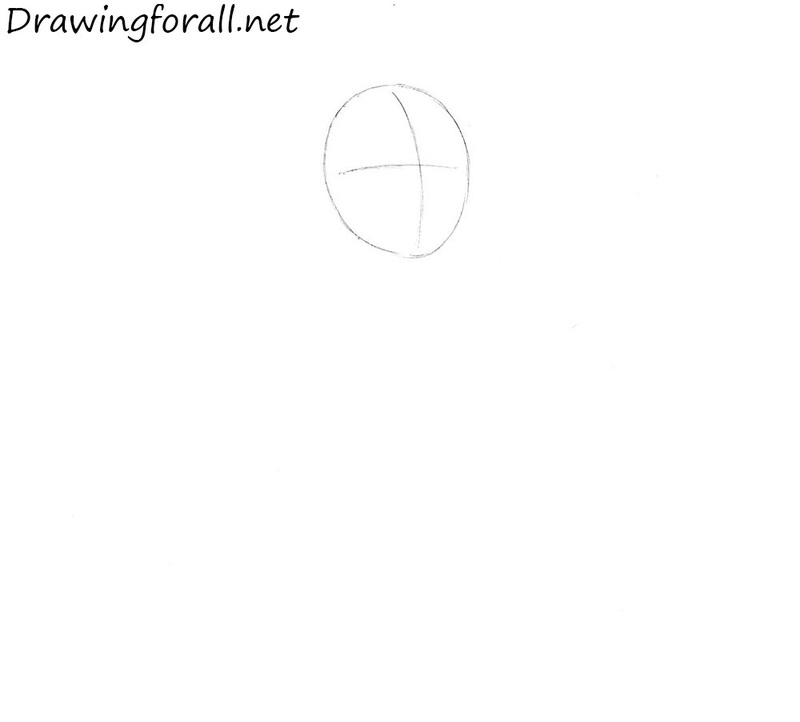 First draw an oval as a guide for the head. Draw the lines for the facial symmetry. Using a cylinder draw the neck. Sketch out the contours of the torso. Sketch out the outlines of the hands. One hand rests on the torso and the second hand will keep the plate. 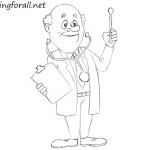 Draw the pelvis using a triangle. Sketch out the legs using cylinders, and knees using circles. 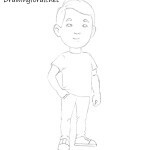 Using the horizontal facial guideline draw the eyes. In order to get merry eyes, draw them in the form of the semicircles. Just above the eyes draw the eyebrows in the form of commas. 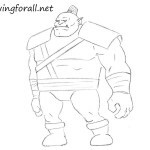 Using the vertical line draw the nose. 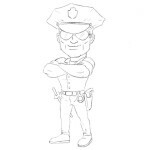 Using a curved line draw the mouth below the nose. Draw the chef cap as in the example below. The lower part consists of a cylinder, and the upper part looks like a cloud. 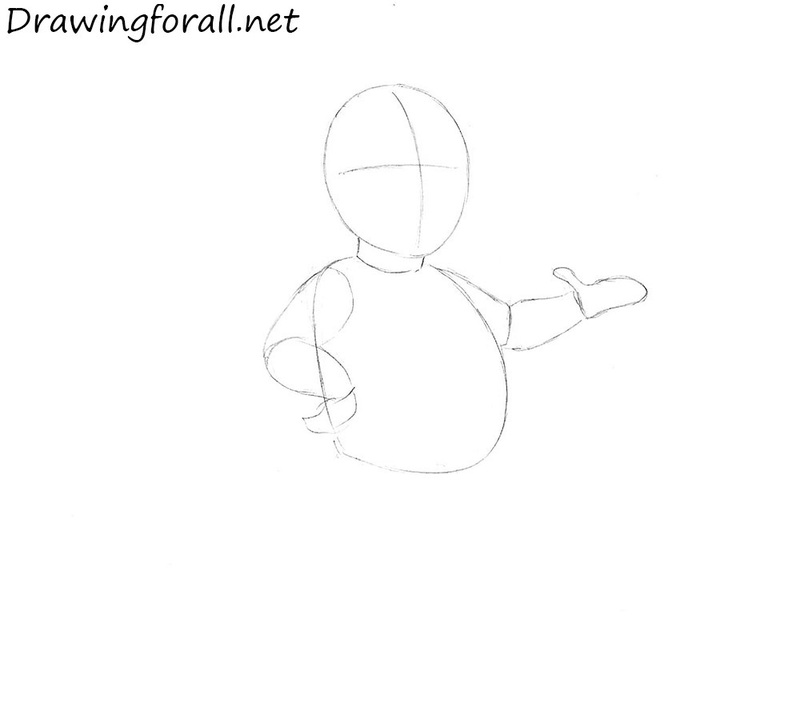 Using curved lines draw hair. Erase the guidelines and unnecessary strokes. Make the lines of head smooth and clean. 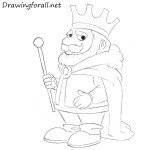 Using short curved lines draw the wrinkles near the eyes. Draw the mustache in the form of commas. Sketch out the scarf around his neck. Using little circles draw the buttons. Draw plate on the left hand of the cook. 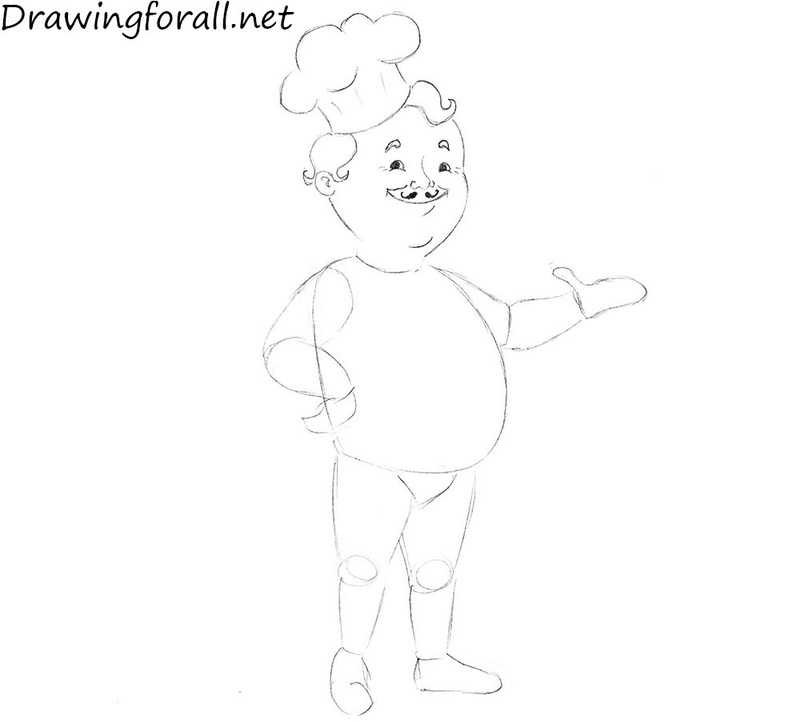 Erase all the remaining guidelines from the drawing. Darken and smoothen the lines. Make them smooth and clean. 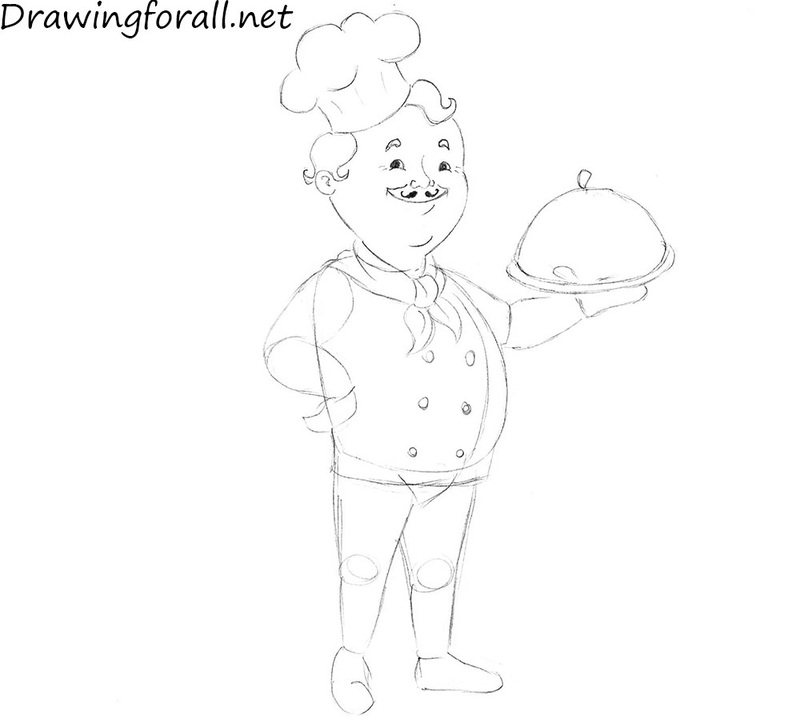 It was the drawing lesson about how to draw a cook for the kids. 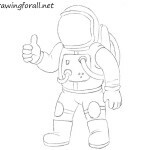 If you like this tutorial, visit our lessons about how to draw an astronaut for kids and how to draw a man for kids. Goodbye!